Tropical depression #19 is shown in this GOES satellite view moving generally south over the Caribbean with sustained winds of 35 mph. 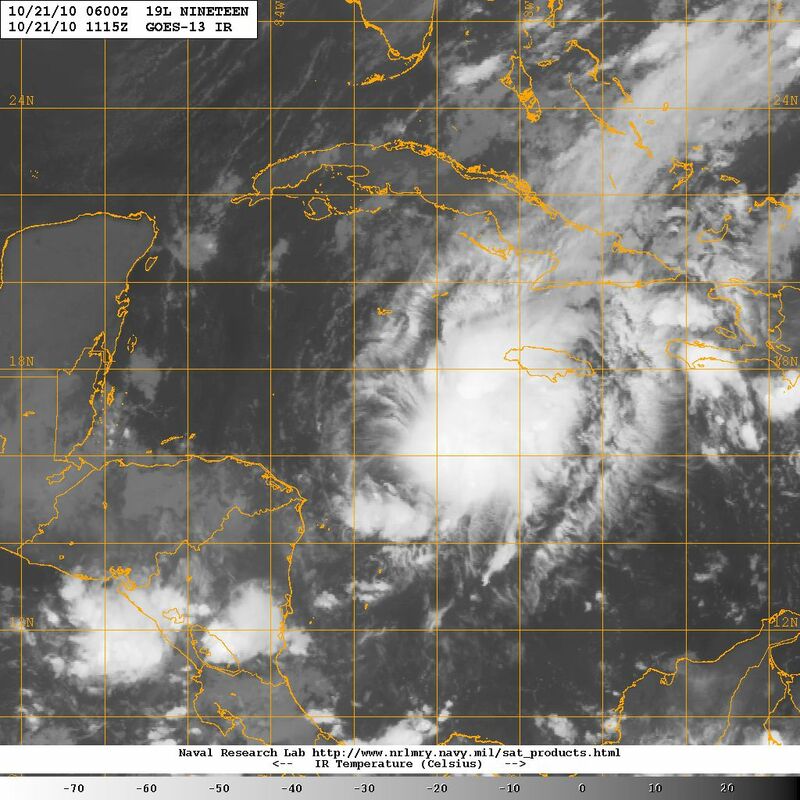 The tropical wave in the northwestern Caribbean has strengthened, as had been discussed in this blog, and gotten better organized during the night to become Tropical Depression #19 of the 2010 Atlantic hurricane season. In the early morning hours on 21 October 2010 this cyclone has been moving in a complex environment and its track had varied considerably over the last 24 hours; where the system was initially moving north by northeast to then turn toward the east, it is now heading south and beginning to turn toward the southwest. (Click of the following link to see TD #19 in motion: http://www.ssd.noaa.gov/goes/flt/t1/loop-avn.html) The models predict completion a full 180 degree turn during the day today so that it will eventually be moving toward the northwest and the Yucatan peninsula. Belize and Quintana Roo, Mexico should monitor this tropical cyclone closely. The environment in wich TD #19 is evolving appear favorable for further development, so it is probable that this system may become a tropical storm in the next 12 – 24 hours and the 17th named tropical cyclone of the 2010 Atlantic hurricane season. Projected track for Tropical depression #19 on 21 October 2010 developed by the Navy Rsearch Laboratory, based on NOAA data and observations. Satellite view of typhoon MEGI on 21 October 2010 as it moved generally northward toward China, over the South China Sea. 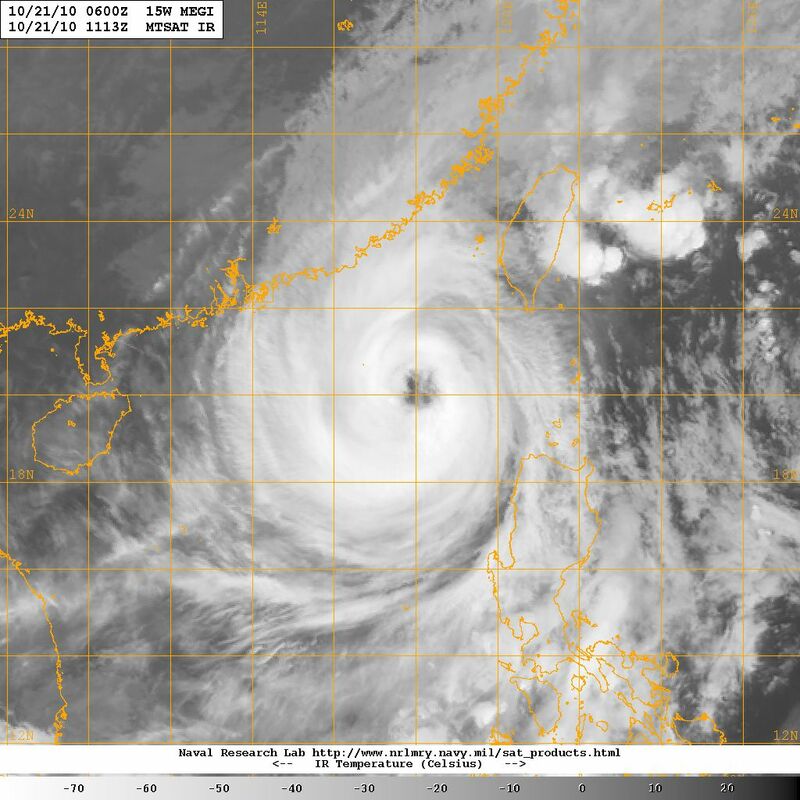 Also today, 21 October 2010, over the South China Sea a very large Typhoon MEGI continues to move generally north toward mainland China with sustained winds of 105 – 110 mph. This typhoon at one point had a diameter in excess of 1,000 miles virtually covering most of the South China Sea; even now as it has weakened some it still reaches from the Philippines to Taiwan and China. Projected track for Typhoon Megi on 21 October 2010, by the Navy Rsearch Laboratory based on NOAA observations and data. 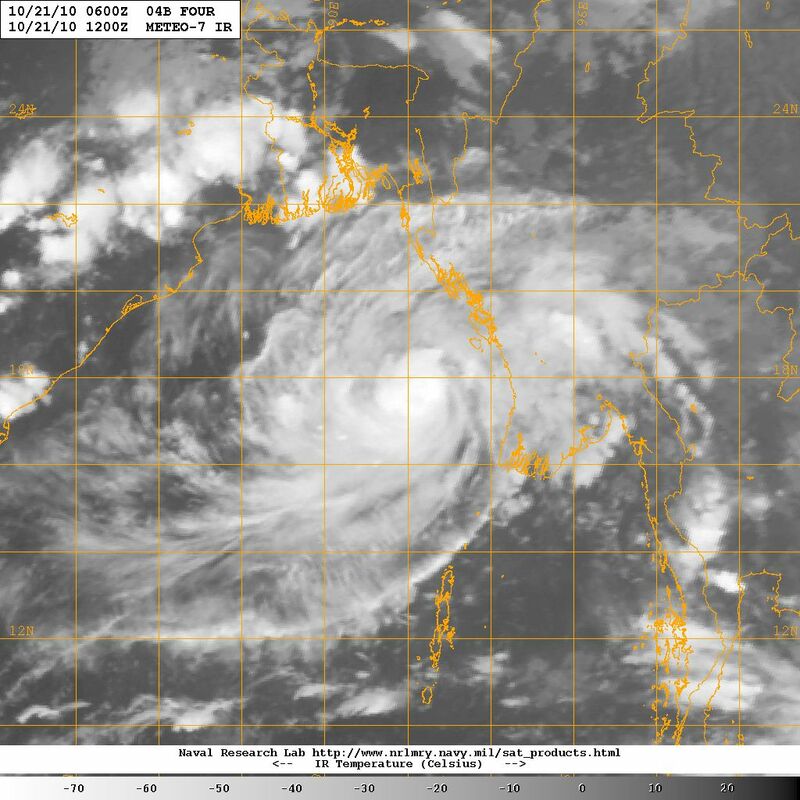 Satellite view of Tropical Storm GIRI in the Bay of bengal, Indian Ocean, on 21 October 2010 moving toward Burma (Myanmar) and Cambodia. Moving east from Typhoon Megi’s current location, all the way to the Indian Ocean, and more precisely the Bay of Bengal we have Tropical Storm GIRI moving generally toward the northeast aiming for Burma and Cambodia. This storm was until recently just an area of low pressure, which in the past few hours strengthened to tropical storm force becoming Giri. As of this afternoon on 21 October 2010 Tropical Depression #19 has strengthened to become Tropical Storm RICHARD, the 17th named tropical cyclone of the 2010 Atlantic hurricane season.